Climate change. Ocean acidification. Plastic pollution. Dead zones. Global challenges like these exist at the complex nexus of political discourse, social norms, economics, scientific research, and even cultural identity. The generation of young people in our schools will soon be asked to step forward as the problem solvers and innovators who are not afraid to take bold action around these global challenges. But will they be ready? While students understand what is at stake, they also realize that the solutions are not easy and their own voices are grossly underrepresented in the discussion about an uncertain future that belongs to them. The good news for all of us is that environmental champions exist in growing numbers. They are committed, focused, formidable, and many of them have not even graduated from high school. EarthEcho International, the nonprofit organization that Philippe co-founded with his mother and sister, recognizes these young people as amazing assets in the ongoing environmental movement. EarthEcho’s programs are developed for and by youth. We focus on meeting young people where they are and elevating THEIR voices. All of our resources are designed to equip new generations of leaders and problem solvers to identify and tackle environmental challenges in their own communities and beyond. Environmental education has traditionally explored the natural world and named the issues facing our planet, but few programs build the critical thinking, problem solving, and collaboration skills necessary to devise real solutions to complex problems. Programs like EarthEcho’s Youth Leadership Council serve to cultivate a more sustainable world driven by youth-led social innovation. Our Challenge programs, including the Water Planet Challenge and World Water Monitoring Challenge, are built on the proven model of service learning to activate youth around creating grassroots positive change in their own communities. EarthEcho offers a variety of curricular units that address specific environmental threats, from dead zones to drought. 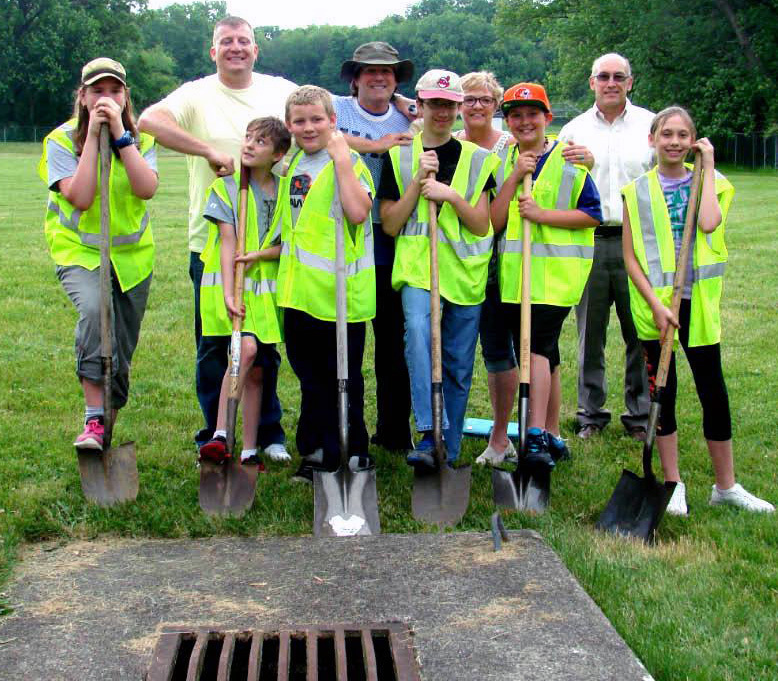 Stormwater runoff, in particular, presents a plethora of opportunities to engage students in learning about civil engineering, history, design, math, and citizen science with real-world applications. Through an audit process and subsequent design of solution, stormwater mitigation builds a context for learning that empowers students to solve complex problems that are unique to their environment. They can (and should) address policy around a particular site or building (politics), differing attitudes about environmental action (social norms), financial limitations on solutions (economics), scientific research, and cultural identity. The service learning process begins by building a collaborative mindset within the class or group. Students assess, “What resources do we have in our group? What are our skills and talents?” Students then launch into a formal investigation of issues of their choosing, guided by group discussion. Students practice multiple research modalities—beyond search engines— specifically employing investigation through varied sources like periodicals, developing questions and identifying social bias through interviews, and quantifying current knowledge through surveys. EarthEcho’s World Water Monitoring Challenge can also be used as an investigative platform to evaluate local water quality by providing baseline data for students to evaluate change over time as they try to solve the problem. In this stage, students expand on their research to conduct interviews, identify community experts for interviews, and/or attend community meetings about local water issues. Essential to this stage is the School Stormwater Management Audit, which allows students to evaluate the built environment and the interaction of that built environment with the surrounding area. The audit incorporates runoff calculations and mapping to better understand runoff and watersheds. During this preparation stage, students should begin to discover and debate the interaction among environmental, economic, and social challenges. Rain Check provides specific tools to support students in discussion and guides students to develop an action plan to address any stormwater management issues on the school campus or within the surrounding community through collaboration and democratic decision-making. Direct Service: Students develop projects in their communities in which they work with others to address a problem through hands-on service projects. EarthEcho provides a number of examples of direct service videos for students to emulate in EarthEcho Expedition: Into the Dead Zone. Advocacy: Students develop projects in which they educate others and influence behavior toward improved water quality in their community. Advocacy projects often integrate campaigning with a partner, so that students gain an understanding of grassroots community organizing with collaborators such as Surfrider Foundation or Waterkeeper Alliance. Research: Students collect data that informs their school district or community decision-making processes. Indirect Action: Students develop projects, such as creating a sign or developing buy ambien cr websites, which teach others about becoming environmental stewards. Reflection is key to understanding, so taking the time to actively reflect and name that reflection throughout the process is critical. Students review their own actions by asking questions such as: How is this going? What am I learning? Does anything need to be changed? Students tell their stories or showcase their projects within the community so that others may learn from their work. EarthEcho also highlights the work of young people throughout the world who are taking positive action through our social media channels and EarthEcho’s Youth Leadership Council. Using #OurEcho students can see stories of their peers taking action to solve pressing environmental problems in their communities. Activating students to lead their own learning opens natural opportunities for seamless cross curricular integration. Jim Trogdon is a middle school science teacher in Coventry, Ohio, whose students have quite literally rescued a stream. Mr. Trogdon’s students work on a variety of projects throughout the school year, including the World Water Monitoring Challenge to examine water quality, and raise trout in their classroom to stock local rivers. They have many opportunities to investigate ecosystem health and become inspired to make improvements. When the students learned that there was an opportunity to daylight a stream—essentially bringing a trapped tributary back from underground—they immediately took action. 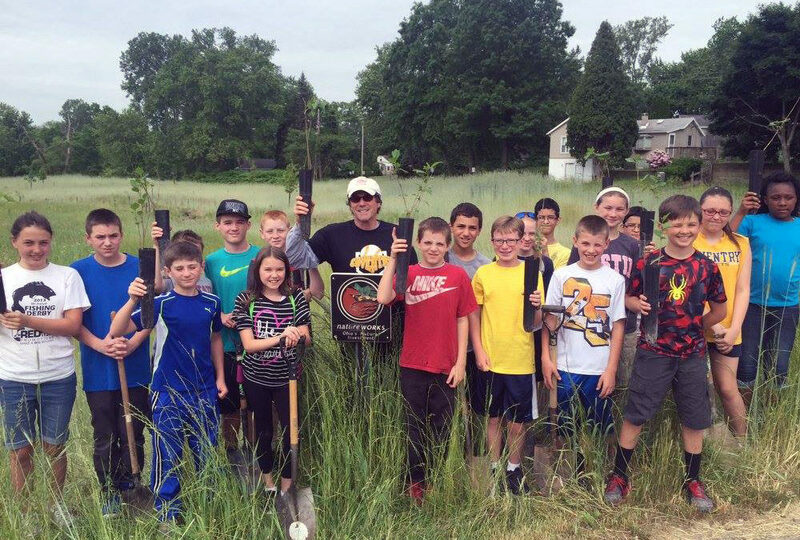 These students were part of a team of professionals including civil engineers, tree planting experts, ecologists, landscape designers, hydrologists, and educators who removed the pavement and culverts that filled the stream with stormwater runoff. They installed bioswales and riparian buffers, and planted more than 1,000 native plants to support the processes that filter runoff and power the water cycle. Similarly, Chris Galiyas, a middle school art teacher in West Mifflin, Pennsylvania, found that his students were demonstrating their learning about watersheds on the “canvas” of a rain barrel. The rain barrel idea was introduced by a local organization, Barrels by the Bay, whose founder, Megan Rosenberger, began the original program when she was in high school. Megan started her own nonprofit before her freshman year in college and continues to run Barrels by the Bay. The students responded enthusiastically to the opportunity to combine the creativity of art with understanding about ecosystems, the water cycle, and ultimately civil engineering. This enthusiasm, much of which led to students working both during and outside of class, resulted in a very public installation of rain barrels at a local amusement park. Chris found the promise that the students’ work was going to be utilized as public outreach resulted in their “putting forth a full effort and really wanting it to be the very best.” That effort clearly shows in the resulting products. Of all the resources at our disposal to solve these complex problems facing our beautiful planet, we are convinced that empowering young leaders provides us with our greatest source of hope and potential. It is our job to recognize their power and help them develop the tools and cultivate the investment that they need to ensure their ideas are heard and taken seriously. Elevating those ideas are at the heart of EarthEcho’s work! To learn more about the efforts of youth acting now for a sustainable future, visit http://www.earthecho.org. Inspired by the legacy of his grandfather Jacques Cousteau, Philippe is an Emmy-nominated TV host, author, speaker, and social entrepreneur who has established himself as a prominent leader in the environmental movement. Philippe and his wife Ashlan co-hosted the number one cable rated Nuclear Sharks for Discovery Shark Week 2016. He is also the host and executive producer of Awesome Planet, a television series syndicated on Fox and Hulu, for which he was nominated for a daytime Emmy as outstanding host. Up next, Philippe will host season two of his highly successful online series ‘The Aquatic World of Philippe Cousteau’ for CNN’s digital platform Great Big Story. Philippe’s latest book, Follow the Moon Home was released in April of 2016. His conservation efforts are focused on solving global social and environmental problems. In 2004 he founded EarthEcho International, an environmental education organization dedicated to inspiring youth to act now for a sustainable planet. EarthEcho has established itself as a leading youth environmental education organization. Investing in a career to improve the way learning happens for young environmentalists, Stacey is a scientist, educator, interpreter, and environmental advocate. In her role at EarthEcho, she supports a variety of programs that put youth at the center of environmental action by helping elevate their voices about the most pressing challenges facing our world. Prior to working with Philippe Cousteau and the team at EarthEcho, she worked with school districts across the U.S. integrating environmental service learning programs into classroom curriculum. Stacey has enjoyed a myriad of opportunities ranging from field studies on sea cucumbers in Panama to co-teaching with extraordinary teachers in Title 1 schools to, most recently, tackling field production on the short form educational videos of EarthEcho Expeditions. During her tenure, EarthEcho’s education programs have expanded to include the World Water Monitoring Challenge, Water Planet Challenge, and the EarthEcho Expeditions programs, as well as integrated Educator and Youth Leadership Councils that are active in developing collaborative programs with EarthEcho International.